Each day, a different selection of local growers, artisans, producers and artists will offer a wide range of foods, gifts, décor and more. Guests are encouraged to return each day to discover a new assortment while shopping the rest of the stores in Frankenmuth. A Farmers Market at heart, the Christkindlmarkt will offer organic cold-weather crops from Lawrence Farms, Hill Farm Chestnuts roasted over an open fire, Hoffman Farms fresh evergreen garlands, wreaths, and maple syrup, Miller's Orchard apples and pastries, UP Pasties, Dean's Jerky and Smoked Meats, Butter Crust Bakery delights, Frankenmuth Fudge Kitchen, Trammel's Sweets, Tozy Tea, Bavarian Specialties, and sauces by Uncle Bob, Sansonetti's, and Six Lugs Cherry Products. Gift-giving options are offered by Kapow and Cabana handmade soaps, jewelry from Stones by Stu and Fairiering Fused Glass, Kelly & Co., and Pike's Primitive Accessories. Home and garden art will come from Marvin Garden, Wild Birds Unlimited, Lalonda Sculptures, Godfrey Baskets, Reynolds Stained Glass, Sterling Iron Works, and Leonard Diesling Birdhouses. Clothing and other gifts include Black Swamp Chainmail, Stewart Knitware, Dylan's Art, Blankets by Platko, and books by Rev. Robert Smith and Louder Than Thunder. 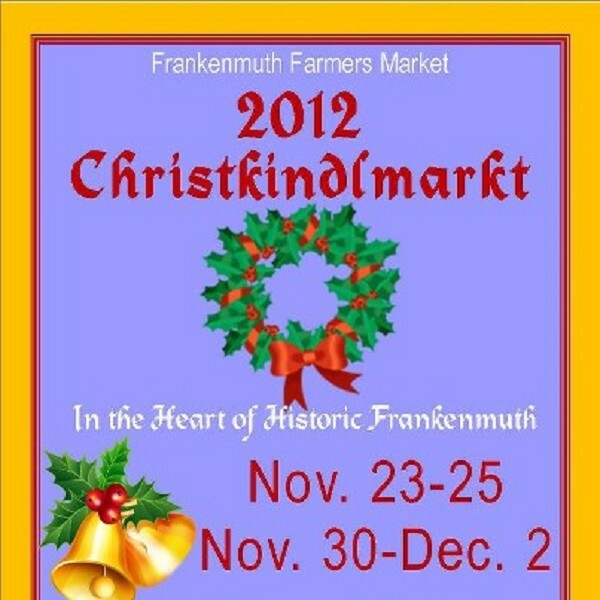 Frankenmuth Farmers Market shirts and merchandise will also be available, along with Market Money gift certificates. Sponsorship opportunities are available, as are opportunities to become a vendor. For more information, please contact Laurajeanne Kehn at (989) 295-9766 or ljskehn@gmail.com. Visitors are also invited to experience the Lighting Ceremony in Frankenmuth's River Place at 6:30pm Friday, November 23. Interested individuals may receive the Market's weekly email newsletter by emailing ljskehn@gmail.com. To learn more, please visit www.frankenmuthfarmersmarket.org.